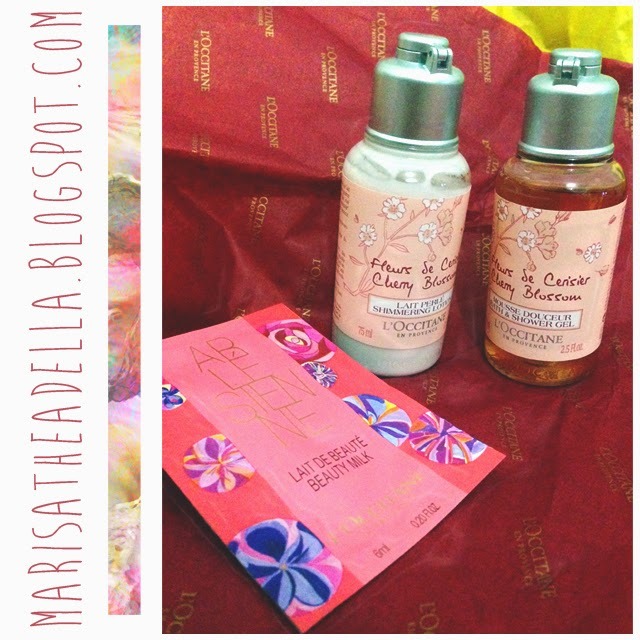 I got L’Occitane body lotion and body shower package as one of my Valentine’s gifts this year. The packaging is sooo pretty that I couldn’t stop myself to open it right away, which is why I do not have the picture of the packaging. I know people normally find it hard to tear a nice packaging, but it surely works in opposite way to me. So as mentioned before, the package contains both body lotion and body shower in travel size (75mL). I love the fact that it is in travel size as I usually bring my body lotion to.. like, everywhere. The container itself comes very handy with solid cap, so you don’t have to worry that it will spill out. The scent reminds me of a floral bouquet- very sweet and light. The lotion enriched with shea butter and cherry extract from Luberon in Provence. It sinks quickly into the skin to moisturize and soften with a bit shimmer. The shower gel smells very good and perfumery. I can assure you that it sticks around for quite long. Oh... what's more lovely? The package comes with a sachet of body milk of the same edition. The texture of the body milk is, for sure, lighter than the body lotion. It doesn't sink as quick as the lotion but stays longer. I am saying that it is a lovely present for Valentine’s Day. The pink color makes it fit perfectly as, conventionally, pink relates to girl and romance. I am not sure how much it costs- and not going to ask the giver for the price as well. Oh, I see. Thanks for the information. Yap, they are undoubtedly wonderful! I love the scent so much. I'd love to try L'EAU, thanks for the recommendation!